Home MTAANI NEWS Wainaina wraps up campaign with great optimism, call for peace. Wainaina wraps up campaign with great optimism, call for peace. Eng. Patrick Wainaina Wa Jungle addressing the residents of Makongeni Estate in one of his final political rallies for the Thika Town Constituency seat. Eng. Patrick Wainaina Wa Jungle wrapped up his campaigns with a blitz, portraying confidence of winning in tomorrow’s election by a very wide margin based on his assessments of the political map. The engineer hopscotched from Ngoliba to Karibaribi in the final, frenzied hours of his campaign, offering hope and optimism to the people as the sprawling map of the Thika Town Constituency was reduced to a string of must-win zones. His mega 1km long motorcade drew big crowds in the vast Township Ward, the thousands of working-class in Kamenu Ward as rhapsodized about his values and vision for the constituency to the people of Hospital, Gatuanyaga and Ngoliba Wards. 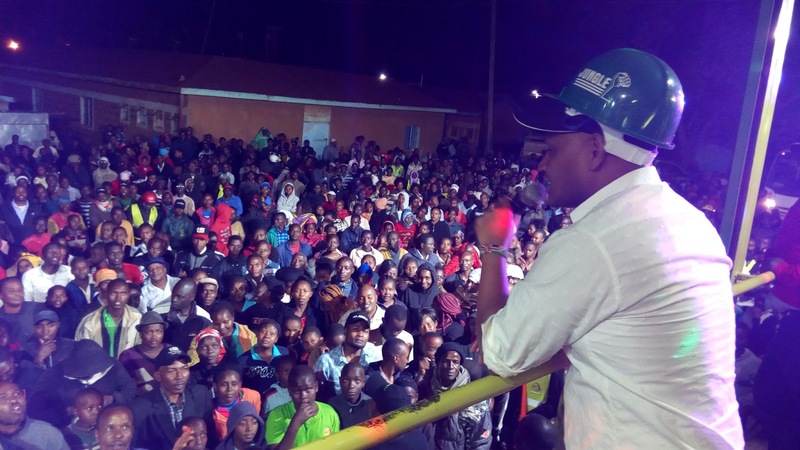 Speaking at various stops on Saturday evening, Wainaina described himself as a candidate riding a wave of momentum to victory, pointing to the massive support his campaign team has been drawing in all wards within Thika Town Constituency. He pleaded with voters to end a traumatic campaign with an emphatic endorsement of his vision for the constituency, vowing to bring back Thika town's industrial status, better and stronger than ever before." “We're hours away from a once-in-a-lifetime change. Eng. Wainaina is offering real change to Thika residents. Come Wednesday morning, it's going to be the very beginning of a new adventure, a new Thika,” said Wainaina. He thanked the residents for the overwhelming support they have accorded him throughout this campaign period and promised them of his devotion to make Thika great again. “I am very happy for the much we have achieved together so far and I just want to assure you that this is just but the beginning. I promise you that the next five years will be the turning point for Thika politics,” he said. He promised to work with all stakeholders to come out with a master plan that will see Thika regained its lost glory of being the ‘Birmingham of Kenya’. “Thika has got great potential in knowledge, skills and talents that are going down to waste. We need to revive the ‘dead’ industries. We need revive youth economy by creating jobs. We need to give hope to existing and emerging entrepreneurs by ensuring that we create a conducive environment for business to grow and excel. That’s the Thika I am promising as your next MP,” said Wainaina. He also pointed out that the constituency had great potential in agriculture and he was going to work with other leaders to draw a work plan to exploit the resources available in areas like Gatuanyaga, Ngoliba and Karibaribi to make them Thika’s food baskets and promote agribusiness. Wainaina added that his main priority as an MP was the development of infrastructure like roads, water accessibility and electricity and ensuring that mwananchi accessed essential services so as to help them grow their own economy. He also promised to sit down with the next county government to relook the issue of business licensing and rates to ensure that they were not a hindrance to development. “We need to relook at the whole business licensing process to ensure that it enhances entrepreneurship and not stifle businesses. We need bring on board all businesses into the system and, in the process, widen the ratepayers’ base, consequently reducing the amount of rates paid by individual traders,” he explained. In conclusion, Wainaina appealed to all Thika voters to come out in large numbers on Tuesday to vote for him and reelect President Uhuru Kenyatta for a second term. He also called on his supporters to be peace ambassadors and pray for peace during and after the elections. He asked them to heed to the president’s call to go home after voting and follow the proceedings from the various sources at their disposal.